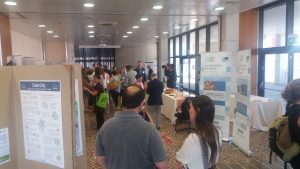 ClairCity partners from Italy attended the launch of the PREPAIR project (Po Regions engaged to policies of air) at the start of June. PREPAIR involves 18 national and international partners, and aims to promote more sustainable lifestyles, production and consumption, as the region fails to meet air quality limit values for particulate matter, ozone and nitrous oxides.. The focus of the action is specific awareness-raising and dissemination actions directed at public, private and local communities. Project presentations, including the ClairCity poster on the left of the photo. The project will establish a near-real time web-based system for sharing air quality and emissions data and air quality models. Measures will focus on four main sectors: biomass burning, energy efficiency, transport and agriculture. Alongside ClairCity, other projects linked to air quality and carbon emissions were also presented during the conference, including LIFE IP (Implementation of Air Quality Plan for Małopolska Region – Małopolska in a healthy atmosphere) and The Life project BrennerLEC: towards a Lower Emission Corridor, that aims to make traffic along the Brenner axis more respectful of the local population’s health and more compatible with the geographical features of the land, in order to protect the Alpine environment.